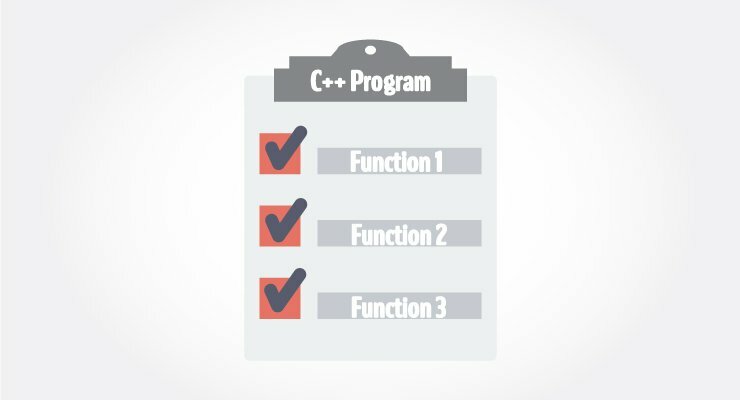 In this article, you'll learn everything about functions in C++; what type of functions are there, how to use them with examples. In programming, function refers to a segment that groups code to perform a specific task. Library functions are the built-in function in C++ programming. Programmer can use library function by invoking function directly; they don't need to write it themselves. In the example above, sqrt() library function is invoked to calculate the square root of a number. Notice code #include <cmath> in the above program. Here, cmath is a header file. The function definition of sqrt()(body of that function) is present in the cmath header file. You can use all functions defined in cmath when you include the content of file cmath in this program using #include <cmath> . 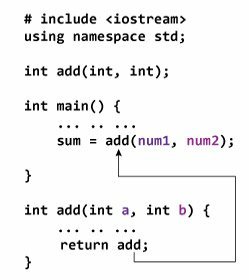 Every valid C++ program has at least one function, that is, main() function. C++ allows programmer to define their own function. A user-defined function groups code to perform a specific task and that group of code is given a name(identifier). When the function is invoked from any part of program, it all executes the codes defined in the body of function. How user-defined function works in C Programming? 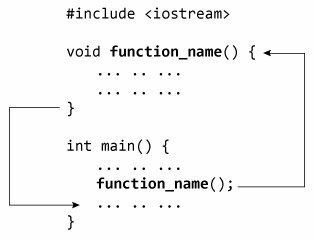 When a program begins running, the system calls the main() function, that is, the system starts executing codes from main() function. When control of the program reaches to function_name() inside main(), it moves to void function_name() and all codes inside void function_name() is executed. Then, control of the program moves back to the main function where the code after the call to the function_name() is executed as shown in figure above. C++ program to add two integers. Make a function add() to add integers and display sum in main() function. If a user-defined function is defined after main() function, compiler will show error. It is because compiler is unaware of user-defined function, types of argument passed to function and return type. You can see that, there is no body of function in prototype. Also, there are only return type of arguments but no arguments. You can also declare function prototype as below but it's not necessary to write arguments. Note: It is not necessary to define prototype if user-defined function exists before main() function. To execute the codes of function body, the user-defined function needs to be invoked(called). In the above program, add(num1,num2); inside main() function calls the user-defined function. The function returns an integer which is stored in variable add. When the function is called, control is transferred to the first statement of the function body. Then, other statements in function body are executed sequentially. When all codes inside function definition is executed, control of program moves to the calling program. In programming, argument (parameter) refers to the data which is passed to a function (function definition) while calling it. In the above example, two variables, num1 and num2 are passed to function during function call. These arguments are known as actual arguments. The value of num1 and num2 are initialized to variables a and b respectively. These arguments a and b are called formal arguments. The type of first actual argument should match the type of first formal argument. Similarly, type of second actual argument should match the type of second formal argument and so on. You may call function a without passing any argument. The number(s) of argument passed to a function depends on how programmer want to solve the problem. You may assign default values to the argument. These arguments are known as default arguments. In the above program, both arguments are of int type. But it's not necessary to have both arguments of same type. A function can return a single value to the calling program using return statement. The figure below demonstrates the working of return statement. In the above program, the value of add inside user-defined function is returned to the calling function. The value is then stored to a variable sum. Notice that the variable returned, i.e., add is of type int and sum is also of int type. Also, notice that the return type of a function is defined in function declarator int add(int a, int b). The int before add(int a, int b) means the function should return a value of type int. If no value is returned to the calling function then, void should be used. 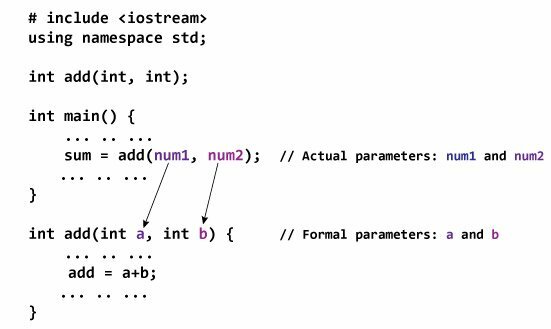 How to pass and return object from a function in C++?